Queue up! Queue up! 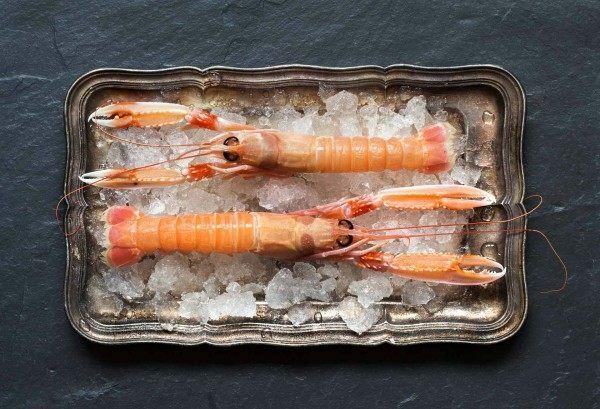 We have a new supply of langoustines which have been very sustainably caught by two men in a tiny boat (picture 2) against a gorgeous backdrop of Scottish mountains (when it's pelting down they can't see the mountains, but we didn't ask for that picture). Anyway, five stars for sustainability and the quality is fantastic. THE ONLY THING IS, these langoustines come in an XL tray. It's 32 x 26 x 6 cms, (think small box of cornflakes). So don't stock up unless you have the freezer space. AND ONE OTHER thing - they quite often contain an intestinal vein, which is harmless, but a bit unsightly. Related links to "Creel-caught Langoustines"